The Cessna 310 was a sleek, beautiful 5 seater aircraft designed and built primarily for business use by the Cessna Aircraft Co. of Wichita, Kansas. 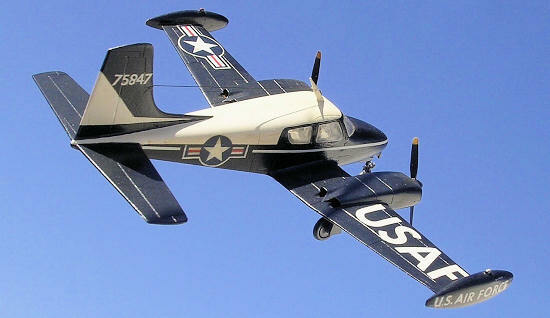 The prototype made its first flight on January 3, 1953. Production for the civilian market began in 1954. Its twin Continental 0-470-B engines develop 240 HP each, allowing a cruising speed of over 205mph and a top speed of 220mph. The Cessna 310 is aerodynamically clean and this is a key factor in the plane’s high performance. Fully loaded it can climb at 380 feet per minute on one engine and has a service ceiling of 22,000 ft and a range of 1000 miles. 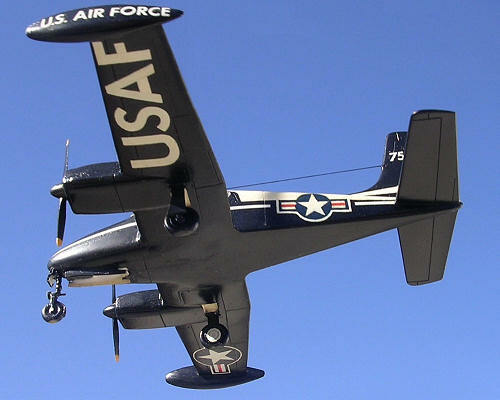 Following a competitive selection process, the Model 310B, a slightly modified version of the original Model 310A, popularly known in the Air Force as the "Blue Canoe”, was ordered for light freighting and liaison service with the USAF under the designation L-27A. This was changed to U-3A in the late of 1962 following rationalization of the US forces designation system. The Air Force eventually bought 160 of the 310s "off-the-shelf" then became known as the U-3A. Thirty-five more were delivered in 1960-61 as U-3Bs. with limited all weather capability and with more powerful engines, additional cabin windows, a longer nose and a swept vertical fin. 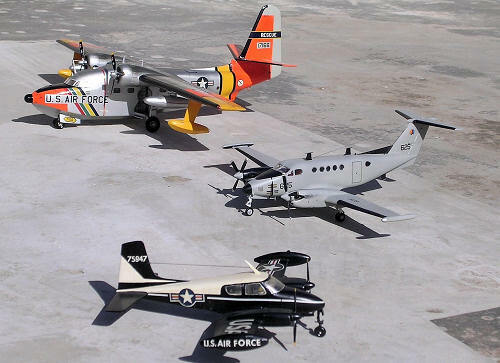 The USAF selected the aircraft for service as a light administrative liaison, cargo and utility transport, all weather. A small number of Model 310s was supplied for service with French Air Force, and to Argentina and the Philippines. The Cessna 310 issued by Comet Series authentic scale models, made in UK by Kleeware was in local shops a good number of years ago. The kit was then not made to standard scale as the trend of the day was to produce a kit to fit a particular size of box. The kit comes in cream colored injected plastic. There were 20 parts, 5 of which were clear window pats. There was a 2-part pedestal base. The kit also contained a cement capsule, of sufficient quantity to serve to build the kit. The kit consisted of 2 fuselage parts, wing parts complete with engine nacelle which are split horizontally comprising 4 parts. Another 4 parts form the tip tanks and two 2-blade propeller pieces complete with hubs and nacelle disc and cap to allow propeller to rotate once in place. There was no provision for the undercarriage parts in fact the wheel wells were closed. The kit was bought along with another, the Piper Apache. My desire has always been to build a military version in preference to a civilian one. The kit can be built into a beautiful model but it is not with0ut faults. Apart from the odd scale, the civil registration is impressed inside the wings and other places which needed filling up and sanding. Also there is nothing in way of interior seating and instruments details, instruments coaming, control column etc. 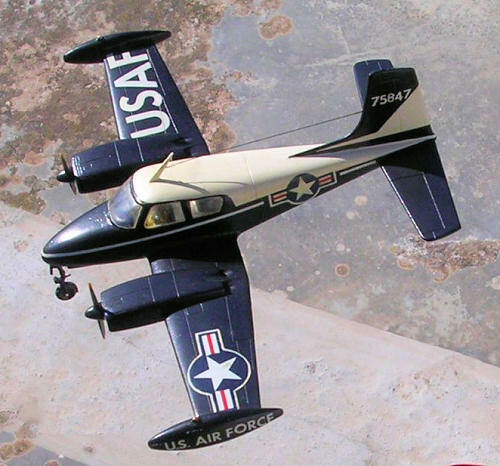 From the time I saw the kit I made up my mind to build a Cessna U-3 liaison aircraft which shuttles between air bases of the USAF. This carried the standard livery of the 60s consisting white top and the rest in black safe for a white trim. I already acquired enough photograph reference for the complete colour scheme that the model was going to wear from a number of photos that appeared in past issues of ‘Air Pictorial.’ Having obtained reference scale plans for the type I first marked the position of the nose wheel doors and the wing wheel well doors. These I marked with a soft pencil, then scratch marked and carefully cut away the opening using an Exacto blade and given the final shape with needle files. Undercarriage doors were shaped from plastic card. Undercarriage legs were fashioned from stretched plastic sprue adding detail as observed from photos. A set of wheels of the correct size were located in my spare parts box. The nose wheel well was boxed but noticed that there was not sufficient space to house the nose weight. I then added interior detail compartment consisting of two side by side seats and another one aft. An instrument panel and control stick was added from spares. The interior was painted in light grey and tapestry in leather brown and after this weight was inserted in the little space provided in the nose and the fuselage was closed. The wings were now in one piece and were slotted inside the fuselage recess. I then slid the one peace tail plane through the location at the rear of the fuselage. The propellers were left to be fitted at a final stage. Respective left and right wing tip tanks were cemented together and attached to each wing tip. The wind shield, which was reasonably clear, was then fitted in place. Considering the age of the kit, very little filler was needed at the wing roots while a special swivel ball stand item was left out and the empty slot under the fuselage was blanked with a piece of plastic that was faired smooth. I painted the interior light grey while wheel wells were white. Wheel legs were black and silver. The clear cabin parts were first masked and the kit given an overall coat of semi matt white. Any areas needing further smoothening or addition of fil er were attended to and the kit was now given a coat of gloss white. Referring to photos of the U-3, I then masked the white areas mainly at upper deck and tail unit area. The rest of kit was airbrushed gloss black. When the kit paint was dry I then obtained the USAF letters from a local shop. These were close enough to the correct size I needed but not quite the right style. Large star and bars insignia were from a Revell kit decal of the F-8. I first fixed the decals on a white decal sheet, and then cut the sheet leaving a narrow white outline at the periphery of the insignia. This was repeated to all the insignias to go in 4 positions. The white fuselage trim was made from a narrow white strip picked from a ‘Runway’ decal sheet. The kit was finally given a semi matt Micro varnish. Although the kit is a ‘getting on’ in age, this was a much needed addition to my long USAF model list of kits I made since there yet is not one kit to representing its service function. It was not a bad value at the time it was purchased and still in spite of its odd scale it did not look out of place among 1/72 scale models. Wearing military colours helped a lot to revitalize the kit.